Dr. Lawrence M. Alligood, Jr. Celebrating the life of Dr. Lawrence M. Alligood, Jr.
Be the first to share your favorite memory, photo or story of Dr. Lawrence. This memorial page is dedicated for family, friends and future generations to celebrate the life of their loved one. Obituary for Dr. Lawrence M. Alligood, Jr.
Dr. Lawrence Moody Alligood, Jr., of Carrollton died peacefully in his home on November 12. He was seventy-nine years of age. Dr. Alligood was born in McRae, Georgia, son of Lawrence Moody Alligood, Sr., and Viola Boney Alligood. He was a graduate of the University of Georgia, Georgia State College, and the Medical College of Georgia. 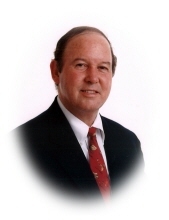 A pathologist and a respected member of the medical community, he practiced medicine in Carrollton for forty years and was the owner of Carroll Medical Laboratory, Carroll Pathology Group, and Hopeton Plantation. Besides his professional interests, Dr. Alligood pursued projects in many and varied interests including medicine, history, literature, farming, forestry, husbandry, and investments. He served on the board of three banks in Carrollton. He was a member of Tabernacle Baptist Church, the American Medical Association, and the Carroll County Irregulars. Dr. Alligood is survived by a wife, Abigail Heck Alligood; a son, Tom Alligood of McRae, Georgia; a daughter, Lou Alice Alligood Rogers of Nashville, Tennessee, and her husband Jonathan; grandchildren Heyward, Henry, Lawrence, Margaret, William, and Betsy Rogers of Nashville, Tennessee; a sister, Linda Cribbs of Douglas, Georgia; a nephew, Ty Cribbs of Madison, Georgia, and his family; and a niece, Rebecca Richie of Warner Robins, Georgia. A memorial service will be held at Tabernacle Baptist Church at 4pm on Saturday, November 17. Visitation will precede the service, from 2pm to 4pm. In lieu of flowers, memorial contributions may be made to Tanner Hospice Care, P.O. Box 1136, Carrollton, GA 30112, Tabernacle Baptist Church, 150 Tabernacle Dr., Carrollton, GA 30117 or Alice’s House, P.O Box 1596, Carrollton, GA 30112. "Email Address" would like to share the life celebration of Dr. Lawrence M. Alligood, Jr.. Click on the "link" to go to share a favorite memory or leave a condolence message for the family.